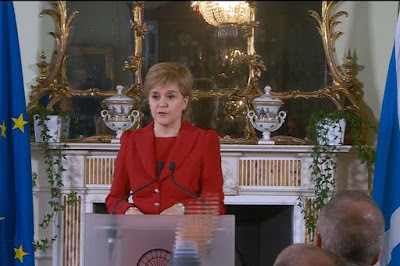 Yesterday, Scotland’s First Minister (Nicola Sturgeon) announced the Scottish Government’s wish to start the process of holding a second independence referendum, once the main elements of the UK’s final Brexit settlement was known. This follows the UK government’s rejection of alternative suggestions put forward by the Scottish government in relation to Brexit – which I previously discussed here. An independent Scotland might not be an EU Member State, at least initially, but rather have an association with the EU either as an interim step toward membership or indefinitely, in the event of political difficulties obtaining EU membership on either the Scotland or EU side (or both). An association with the EU might well be closer than the relationship between the remaining UK (rUK) and the EU – particularly in light of the UK government’s intention to leave the EU single market and customs union. The most obvious route for Scotland to consider would be membership of the European Economic Area (EEA), along with Norway, Iceland and Liechtenstein. The EEA provides for participation of these non-EU countries in the EU’s single market freedoms and all the EU legislation related to them, as well as most EU employment and environmental law. But Scotland would not be covered by EU laws in other areas, notably agriculture, fisheries, tax and justice and home affairs – although, like Norway and Iceland, it could sign separate treaties with the EU on these issues. Although the current EEA countries have joined Schengen, this is a separate issue (agreed years after the EEA), and Scotland would have no legal obligation to do the same. There would be no obligation to join the EU single currency (or any related constraints regarding deficits), and most significantly Scotland would be free to sign separate trade agreements with non-EU countries, because the EEA does not cover the EU’s customs union. This is particularly important because it means Scotland could seek to retain a closer economic relationship with the rUK than the rUK might have with the EU. Scotland could also “go global”, as Brexiteers say, by signing up to the free trade treaties already signed by members of the European Free Trade Area (EFTA: the EEA states plus Switzerland) with non-EU countries. (In principle, EFTA membership requires this). And it would retain power to sign its own treaties on top (or to seek to retain its own versions of the EU’s free trade deals with non-EU countries, as the rUK is likely to do). Scotland would have to become a separate WTO member, but could try to fast-track this by copying the rUK’s process of detaching from the EU’s WTO membership. Is there a downside to EEA participation? Some have argued against the UK joining the EEA due to objections to single market participation, the need to accept ECJ jurisdiction, continued contributions, its undue size compared to other members, or its lack of influence over EU laws which would apply to it. Are these arguments transferable to Scotland? The first to third objections are not, since Scots voted to remain in the EU, entailing the single market, ECJ jurisdiction and budget contributions anyway. (In fact, the non-EU EEA countries are not subject to the jurisdiction of the ECJ, but a separate body called the EFTA Court: it usually follows ECJ case-law, but its decisions are not always binding. EEA financial contributions do not go straight to the EU budget, and would logically be recalculated in light of Scotland’s economic position anyway). The fourth objection (size) is unconvincing: Scotland is broadly comparable with Norway, in particular in terms of population, location and economy. Finally, EEA states have a modest say on EU laws, being consulted on draft EU legislation and having the option to reject the application of new EU laws (although the EU might retaliate if they do that). Anyway, this is certainly more say over EU laws than Scotland would get after Brexit as part of the UK. In fact, it’s more say than Scotland gets over EU laws while the UK is an EU Member State – given the marginal influence that Scotland has over anything that the UK government does. So the EEA option includes things that Scotland seeks (single market participation) while steering clear of things it may wish to avoid (the single currency and deficit criteria, Schengen, EU trade policy with non-EU countries, and EU fisheries policy). It also has the advantage of being potentially far speedier than joining the EU: the EU can decide to apply treaties with non-EU countries provisionally, pending national ratification. What about the prospect of a ‘Spanish veto’ over Scotland joining the EEA? Here we have actual evidence to suggest that it’s not very likely. For the EU has recently concluded an association agreement with Kosovo – despite Spain (and four other Member States) refusing to recognise the independence of that country after its unilateral declaration of independence. (Note: the EEA is also an association agreement, and Member States have a veto over the initial conclusion of such treaties). Failing EEA membership, Scotland could still seek other forms of relations with the EU which may be closer than the rUK might enjoy, possibly as a non-EEA member of EFTA like Switzerland. Unless Scotland followed Turkey in joining the EU’s customs union, this would again leave it free to simultaneously retain a strong economic relationship with the rUK. I blogged on this issue in 2014, during the first Scottish referendum, but I’ll summarise and elaborate on those views again. The basic point is that the Treaties list the Member States by name, and since the ‘United Kingdom’ is unlikely to be interpreted as automatically referring to Scotland alone after independence, either an accession Treaty (Article 49 TEU) or a Treaty amendment (Article 48 TEU) is necessary to include Scotland’s name as a member. The Treaty amendment route – which the Scottish government called for in the previous independence referendum – could also entail an amendment to Article 49 TEU, if necessary, to refer to the special case of Scotland: “By way of derogation from the above paragraphs, Scotland shall accede to the European Union pursuant to the Treaty of Culloden”. One possibility is a Treaty amendment which simply replacing the words “United Kingdom” wherever it appears in the Treaties with “Scotland”; this would mean that Scotland retained the UK’s opt-outs from the single currency, justice and home affairs and Schengen (the budget rebate is set out in secondary legislation). This is perfectly feasible legally, and there is a firm precedent in the Treaty of Lisbon, which in Article 2(2) to 2(8) provides for a whole host of amendments just like this: replacing “Community” with “Union” wherever it appears, for instance. However, the EU position at present is that it will insist upon an accession process under Article 49. This would entail a negotiation process, which could possibly be fast-tracked in light of Scotland’s existing de facto EU membership as part of the UK. It should be noted that when Iceland applied to join the EU in 2010, the Commission’s opinion on accession took account of Iceland’s EEA membership, and indeed it was possible to close many negotiating chapters quickly, before Iceland withdrew its application in 2013. By contrast, only one out of 35 negotiating chapters has been closed with Turkey, after many years of talks. Since unanimity of Member States is required in any event, some have argued that there is a risk of a Spanish veto of Scottish accession, because of concerns that Scotland obtaining easy EU membership would inflame separatist tensions in Spain or other countries. On the other hand, some have argued that these concerns are misplaced. Another argument is that the EU might not be willing to talk to Scotland until it is fully independent – although it should be noted that the EU has relations with Kosovo (see above), even though not all Member States recognise that country legally. This brings us to opt-outs. If the EU is not willing to extend the UK’s current opt-outs to Scotland, this would in principle mean full participation in the single currency and justice and home affairs policies, as well as the loss of Scotland’s share of the UK’s budget rebate to Scotland. Each issue is worth further discussion. The rebate is set out in secondary EU legislation which usually is reviewed every seven years or so, and must be agreed unanimously. Scotland would therefore be in a position to refuse its consent on the next occasion unless a rebate were agreed. As for justice and home affairs, a distinction must be made between general EU policies and those related to Schengen – the border-free area. On the latter point, there is already a protocol to the Treaties which guarantees the continuation of the ‘Common Travel Area’ between the UK and Ireland – which will continue to apply after Brexit. The details will have to be worked out, but the starting point legally is a requirement imposed upon the EU to protect the common travel area. Arguably this not only protects the Irish position concerning the Northern Ireland border in Brexit talks, but also the position of Scotland in potential accession talks. And whatever solution is found for the island of Ireland is therefore transposable to the (rather shorter) border between Scotland and England. As regards other JHA issues, the UK already takes part in most civil and criminal law EU measures, and so Scotland’s participation will not change anything. It should be noted that Scotland would not have to take part in the planned European Public Prosecutor, as that body will be set up by means of ‘enhanced cooperation’ and new Member States do not have to participate in measures set up by that EU framework, which is a system allowing for the adoption of EU law by a group of willing Member States, allowing the unwilling Member States to stay out (see Article 20(4) TEU). That brings us to the single currency – and the related issue of deficits. Scotland’s deficit upon independence is sometimes discussed as if it can be calculated with absolute certainty. This is false: the actual deficit in practice would depend upon the terms of Scotland’s arrangements with the rUK, including its share of rUK debt, as well as broader trade and economic developments, including what currency Scotland uses and the decisions on tax and spending which a Scottish government takes upon independence. While new Member States have in principle an obligation to join the single currency, it must be noted that the EU does not attempt to enforce this obligation. Sweden has not joined since the currency was created in 1999; Poland, Hungary and the Czech Republic have not joined since 2004, when they acceded to the EU; and Romania, Bulgaria and Croatia have not joined either. As for the deficit criteria, there is a requirement of 3% of GDP in order to join the single currency. But that is not a requirement to join the EU. Otherwise why have so many new Member States not simply joined the single currency soon after EU membership? In any event, this is easily provable: the Commission’s monitoring report on Croatia joining the EU noted that it had 4% and 5% debts in the years just before joining the EU. But its membership was still approved. Of course, a large deficit is going to cause a country other difficulties besides EU membership, and in the event of EU membership the rule is in principle that a country should aim for deficits less than 3% of GDP after joining. But this rule is not absolute and the EU has little means to enforce it: sanctions for breaching it can only be imposed upon Eurozone countries, and the EU has never imposed them anyway. There would be strict conditions imposed upon any bailout deal (if necessary), inside or outside the Eurozone – but that would also apply outside the EU, for countries that need a bailout from the IMF alone. Whether Scotland might have an unmanageable deficit is certainly an important issue – but it’s quite false to say that “it can’t join the EU unless its deficit is less than 3%”. Thanks Steve. Regarding the rebate I would expect it to be removed alongside the withdrawal agreement. I very much doubt that the EU27 will ever agree to a specific national rebate again for any Member State let alone an acceding one. Thanks for an interesting article Steve. Article 38 of the Vienna Convention establishesrules governing the passing of state debts when the transferred territory is a newly independent state, leaving behind the original state. which the succession of States relates and the property, rights and interests which pass to the newly independent State. It's pretty clear, as a matter of international law - a ceding state, like Slovenia, Croatia or, in this case, Scotland, has NO legal duty to take on a portion of previously UK public debt, unless it agrees voluntarily to do so. As such, there can be no 'de-rating' of Scotland's credit, because there is no obligation to pay on which to welch. Actually this question was raised in the 1st referendum and was answered by a UK government minister (cannot remember who was it and don't have the link); UK government will be solely responsible for all its debt. The debt can be used as a bargaining chip when dividing the assets. If Scotland were to relinquish its claim on assets (and therefore the debts), it will literally be debt-free from day 1 of independence. The convergence criteria which must be met before a Member State can adopt the euro include a requirement to participate successfully in the Exchange Rate Mechanism (ERM II) for at least two years prior to adoption. But there's no legal requirement to participate in ERM II, so any Member State with a 'derogation' can keep this by not participating in ERM II, as Sweden, Poland and other Member States have done. As for Schengen, even if Scotland was placed under a formal obligation to eventually participate, it could avoid this again by deliberately failing to meet the required preconditions. There is no protocol for Scotland's situation but there is a well defined process and procedure and Scotlands position within the EU will be decided by he European Courts by European Judges, it is them who will first determine what Scotland is, and it seems to me during that process they will need to also determine if the EU can abandon 5 million already EU citizens? To do so would go against the core and fundemental the EU and would tear the very fabric of the EU long before brexit ever could. There is not much scope for EU judges to get involved at the pre-accession stage - they have previously said cases involving potential eligibility of new Member States are inadmissible. But I agree there may be some legal problems, particularly distinguishing between Scots and rUK citizens re EU citizenship. Very interesting, especially for somebody not at all familiar with the many legal aspects. The simple answer is that the UK government has no interest in considering this idea. Thanks for a very informative article. One question in relation to the distinction between Article 48 and Article 49. I read in a not particularly reliable source (i.e. a newspaper comments thread) that while the Article 49 accession route requires unanimity, and hence could be subject to a veto by Spain or some other Member State, Article 48 amendments are subject to qualified majority voting and so might avoid the risk of vetoes. Is this correct, or is it just another lesson for me not to trust anything I read BTL on newspaper articles? It's another lesson, I'm afraid. Article 48 requires unanimous voting and national ratification too. Sorry Steve can't seem to reply on my phone, it's your use of java script not mobile friendly. That's fine except Scotland is not a new member, that is my point there has to be a pre-accession to determine what Scotland actually is and crucially ascertain the position of 5 million already EU citizens, these 5 million already EU citizens asking to remain EU citizens are not going to simply disappear, and taking that question to the EC is standard EU process and procedure you can't just dismiss it because it wasn't a thought in your initial paper ? No, the ECJ does not accept cases on the position of future member states, and the EU position is that Scotland would have to reapply. Whether I mentioned this issue originally is irrelevant to my reply. But again, I do agree that the rUK/Scottish citizenship distinction will be an issue one way or another (for the EEA option too). It just can't be resolved by asking the ECJ at the outset. A clarirication. The ECJ *can* address issues in advance when it comes to association treaties with the EU as distinct from accession treaties. So issues relating to Scottish accession t o the EEA could be sent to the ECJ in advance. But in that scenario Scots wouldn't be EU citizens, but rather covered by free movement law as part of the EEA. There is also a broader possible debate about 'deprivation of EU citizenship' as a result of Brexit, but that isn't limited to Scotland but applies to any UK citizen. Thanks from myself too. I have pointed out a number of these things to people of a unionist/propagandist persuasion online. It will be useful to point to this due to your legal knowledge and status and the linked references. I also appreciate your desire to neutrally set the record straight on matters of demonstrable fact. As a Yes campaigner and Remain voter I would be unhappy with EEA/EFTA membership. We voted Remain to stay in the EU, not half in and half out. While I appreciate the fisheries argument not enough has focussed on the fact that Westminster continues to refuse Scottish input on the fisheries negotiations and after EU Accession we would have our own voice in subsequent negotiations which would surely be a better position for our fishers than the current one. Besides apparently many skippers have sacked their Scottish crew and hired much cheaper Far East sailors to replace them on worse conditions. So my sympathy for them is not what it might be. I remain optimistic that sensible border arrangements can be come to. The Scottish border may be shorter than the Irish Border but it has been unmilitarised/controlled for 300 years and includes some rather wild and remote high country areas. The Trans Pennine path crosses and recrosses it multiple times. It would be no small and likely fruitless task to attempt to control it with controlled crossings in the traditional manner. In the information age with country of origin tracking for any manner of goods it cannot be impossible to do it online. Scotland again want referendum, they already tried it and now they are going for it again.